We started thinking about making Valentines early this year. I think it was just after Christmas when our Oriental Trading catalogue came in the mail. You started flipping through the pages in search of the perfect Valentines. Of course, when you came to the page that pictured our Valentines from last year, you excitedly told me you wanted to make owl Valentines again. I was not as excited about a repeat owl Valentine year. I know you studied owls in your classroom recently & we embraced the owl theme with Halloween Owl Cupcakes & Christmas Owl Ornaments, but I was over our Owl Valentines. I loved them, I really did, but for starters, they took forever. To add to that, you didn't get to participate as much as I would have liked. I really wanted to make your Valentines together. I saw some cute flower Valentines in the catalogue that looked fairly easy to make, but then I saw a way to make our own. 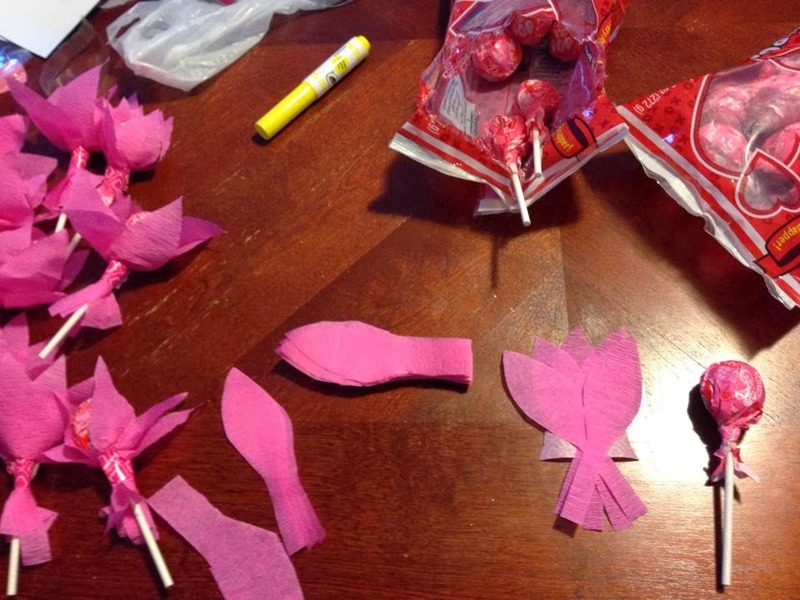 I thought about how perfect the lollipop flowers would be with the picture Valentines we made & loved two years ago. I talked to you about my idea, & you were excited about it. So, photo flower Valentines it was! The first thing we needed was pictures of you- which meant photo shoot time. I wanted to do something a little different for the background of this shoot. I made an inexpensive & easy (but time consuming) floating heart backdrop for some heart filled fun. I also wanted pops of color & made a backdrop out of fabric. For that I needed, 2.5 yards of five different kinds of fabric in pink & gold hues (I used mostly sheer kinds, but thicker, more solid fabrics would have worked as well. Some of the fabrics I chose were sparkly, & they made a sparkly mess throughout our house. Lucky for us, we like a little bit of sparkle), a roll of ribbon, & fabric scissors. I cut each piece of fabric lengthwise into strips that were approximately two inches wide (it doesn't need to be exact). Once all the fabric strips were cut, I began tying them to a piece of ribbon that was approximately two yards wide (smaller if you want to cover a smaller area & larger if you want to cover a larger area), being sure to rotate the colors as I went. 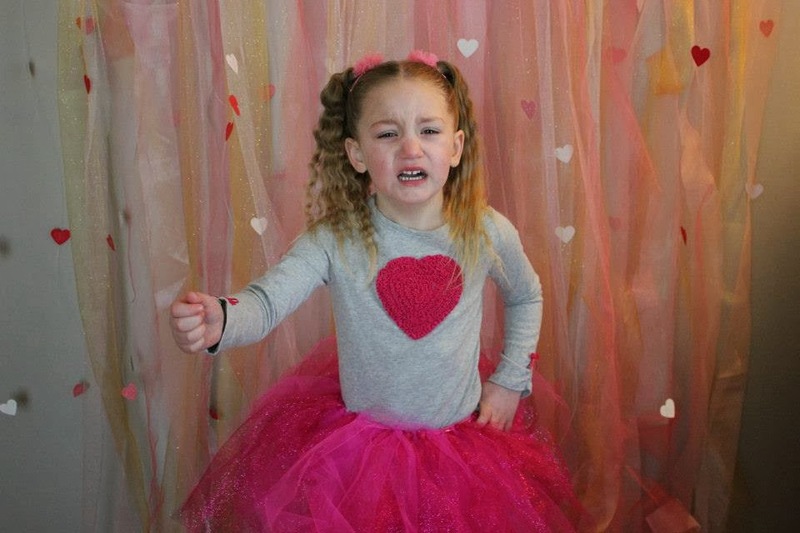 The finished product was a very sparkly, colorful, Valentine's backdrop. I hung up the backdrop using tape & asked you to stand with your arm held out until we got the perfect photo. There were some times you wanted to kill me, but we were both thrilled to get the perfect shot of you for your Valentines (or maybe you were just thrilled to be done). I edited the photo with added text & had forty copies printed. The next thing we had to do was make the flower portion of the project. 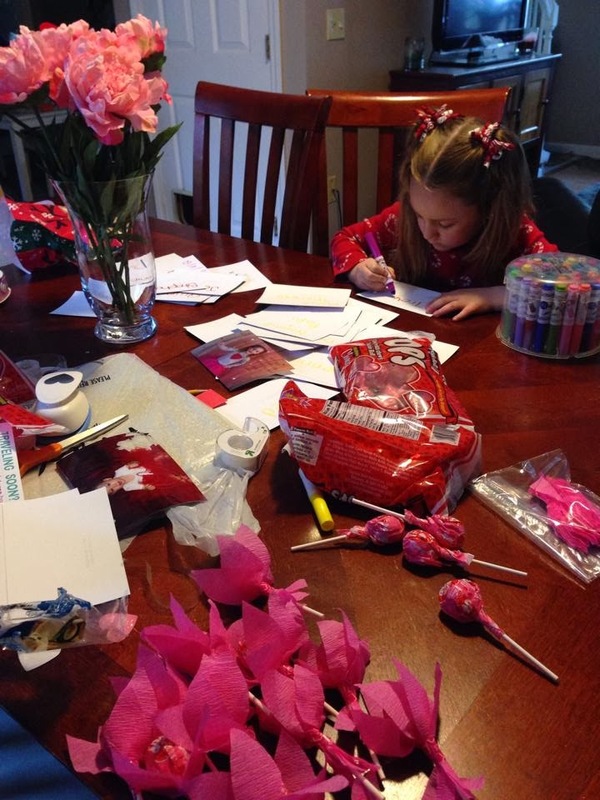 I bought two rolls of streamers in red & pink for less than a dollar & three bags of Valentine themed Tootsie Pops. I knew you wouldn't be able to help me cut out the petals & waited until you were in bed to start that part of the project. I folded the streamers into multiple layers so that I could cut the petals out in bulk while I was sitting down & watching TV. I thought you would be able to help me with the petal assembly part, but it was actually a lot harder than I thought. I ended up layering five petals on a small strip of tape, placing the lollipop on top, placing a petal on top of that, & trying to tightly wrap the tape around the lollipop. I was actually having such a tough time, we almost nixed the flower idea altogether. But I figured I already had the materials, & if we were going to reuse the same Valentine idea, I felt like we had to up the anti a little. Except that here I was working on your Valentines without you again this year. Sigh. It was in the middle of this frustration, that I had a great idea. I asked you if you wanted to write names on the back of the cards. You were thrilled to do anything to help. So, I wrote the names of each of your friends & family in yellow on the back of each card. You happily traced over each letter with a pink or purple marker, sounding out & reading each name as you went along. I wasn't originally planning for your Valentines to be a lesson in reading & writing, but it made my heart happy to see how content you were that it was. You were so pleased with yourself each time you correctly sounded out the names of your best friends, & I was so amazed & proud to see how much you're learning & developing. 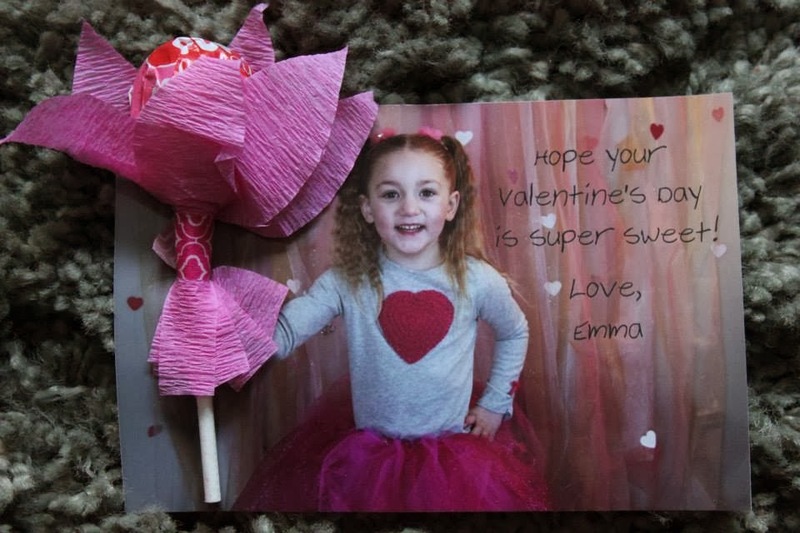 I cut 2 little slits (probably less than quarter of an inch diagonally) in your Valentine photos, one just about your fist & one just below it, with an exacto knife. 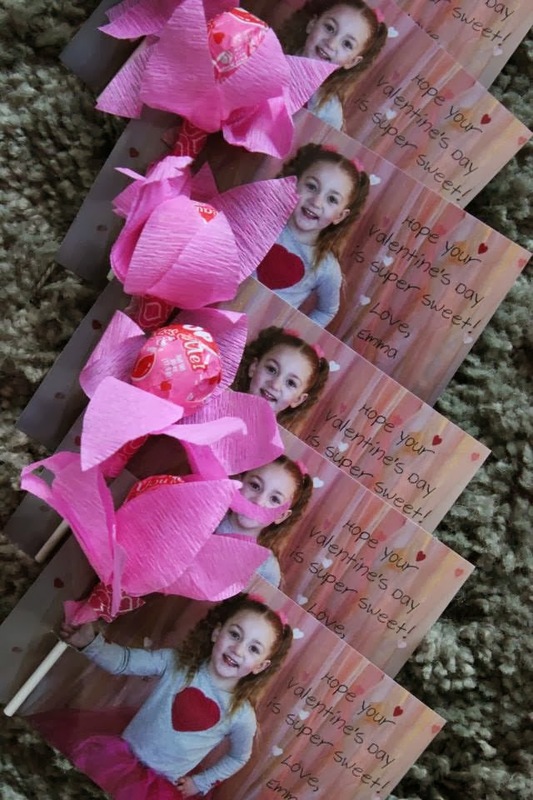 Then I slid the lollipop flower stems into the slits & fastened them with a piece of pink washi tape on the back. I think they came out wicked cute. They are probably my favorite Valentines yet. 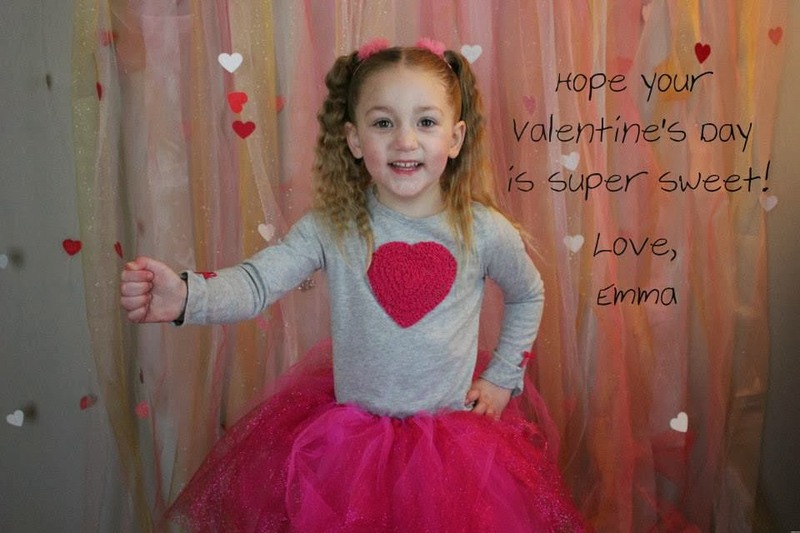 Plus, your very own writing gives them that extra personalization from sweet, little you (you even wrote one out for me...all by yourself...spelled M-O-M-E for Mommy). While you won't hand yours out at school until Friday, we mailed some to our family already. You've been thrilled to know how surprised & happy they've made some of our very favorite people. I have to admit, your Valentine makes me feel quite loved this Valentine's Day.